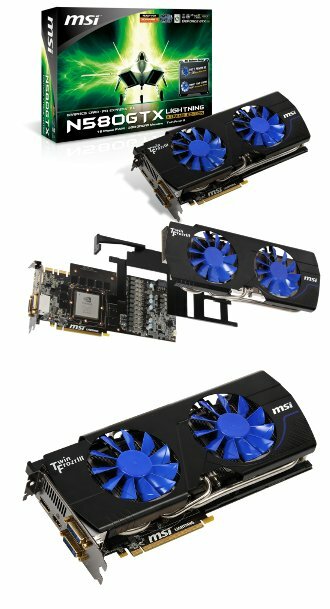 MSI introduced the N580GTX Lightning Xtreme Edition at Computex. This card has a 832MHz core, 1664MHz shaders and 3GB GDDR5 clocked at 4200MHz. For Xtreme overclocking enthusiasts, the MSI Lightning series has always been the graphics card to die for. The N580GTX Lighting Xtreme Edition, which is being shown for the very first time at Computex this year, not only comes with a massive 3GB of graphics memory, but also incorporates the Propeller Blade fan featuring two new technologies (Smart Temp Sensor and Dust Removal) and Twin Frozr III cooling. The new graphic card also supports Afterburner's latest Triple Temp Monitor technology. The N580GTX Lighting Xtreme Edition’s combination of Power4 Architecture power supply and extreme overclocking design features unique to the Lightning series leave it the undisputed king of single-GPU graphic cards! MSI's proprietary Afterburner utility is the industry's most comprehensive and most powerful professional graphics card overclocking utility and has many followers in the media as well as followers among overclocking enthusiasts. This year's Computex will be used to showcase the latest feature added to Afterburner: Triple Temp Monitor for GPU/Memory/MOSFET. Using temperature sensor chips on the graphic card, Afterburner's monitoring window can display the GPU, memory, and power supply module temperatures in real-time. This not only enables the user to monitor the graphic card's operation, but also to check system temperatures in order to make improvements to the system’s overall cooling strategy for smoother operation. In addition to the latest Triple Temp Monitor technology, Afterburner also comes with the “Predator” video-capturing feature. Gamers can use Predator to capture ingame video and then upload their clips to YouTube to relive their favorite moments. Other MSI-exclusive features supported by Afterburner include Triple Overvoltage, advanced fan-speed control and 5 types of overclocking profiles. Be sure to come experience it all for yourself by visiting the MSI booth at L607 in the Nangang Hall at this year's Computex!